Making ravioli at Easter is a tradition in my family, one that Dave and I have continued with our friends. We hold a pasta making party on the Saturday night before this Sunday holiday- which often times is attended by more people than the actual Easter dinner itself... and has been known to continue into the next day! This year's party was a blast- a whole new group of friends attended, made pasta, drank wine and played Wii. Everyone got their hands in the dough and everyone was sent home with fresh pasta. I can't wait till next year! We offered two types of fillings this year, one was a classic ricotta cheese filling and the second was the turkey sausage and fennel filling I created to show everyone how easy is is to diversify the filling. Both stand up wonderfully to a simple drizzle of olive oil with a sprinkling of Parmesan cheese and fresh ground black pepper. Because of the holiday, I did create a classic red sauce (often times referred to as Sunday Gravy) as seen in the photo below . 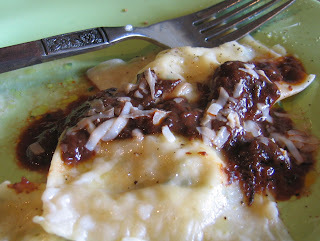 The cheese ravioli is superb with a drizzle of balsamic reduction as well; the balsamic vinegar becomes so thick and sweet - it only takes a little to be powerful. Every time I make this ricotta cheese filling it's different, similar, but different. I have a habit of not measuring ingredien ts so I just go by what tastes good to me that day, adding a little extra this or that depending on the day. The recipe below is pretty much my base recipe of what I put in every time I make this particular filling, so feel free to deviate from it in terms of adding more cheese or less garlic. Just taste it and decide what tastes good to you! 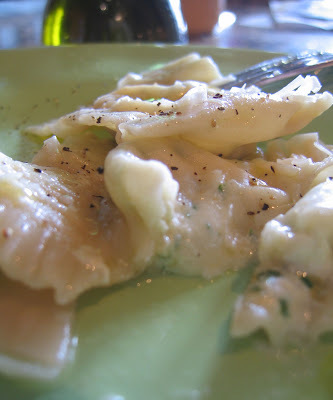 For the pasta dough itself, look to my posting for Homemade Pasta. For an interesting meat filling, do check out my Fennel Sausage Ravioli, or make this super simple cheese filling. Both are amazing and just may find yourself starting your own Fat and Happy ravioli making tradition. 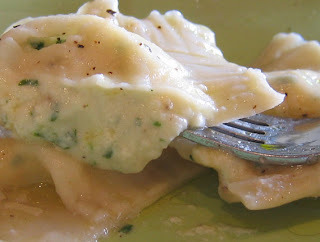 Tips and techniques: It's easy to overfill ravioli - heck we all want lots of filling! But do be conscientious of how full your ravioli's are, these are delicate creatures and can break open easily. Also, be sure to pook each ravioli with a toothpick before adding to the boiling water to allow steam to release and keep them from exploding. Mix all the ingredients in a bowl until well combined, taste, adjust accordingly. (if you're worried about the tasting a raw egg, leave out the egg until after you taste.) Do make this before starting the pasta dough so that all the flavors have a chance to meld. Just set it aside on the counter. You can make this the night before too! Simply refrigerate. Follow my homemade pasta directions for the dough. 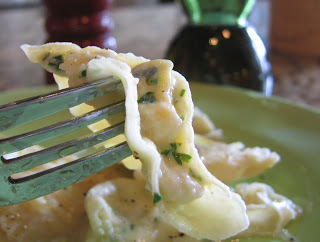 There are many ways and shapes for ravioli - quite simply, you need a top and a bottom whether they are square or round. Use a spoon to drop the filling on the bottom shaped dough, brush the edges with water or egg. Add the top dough; use the tines of a fork to seal the edges. Boil water and cook immediately or freeze for up to a month. If you decide to freeze, put the directly into boiling water from the freezer when you are ready to eat them. Do not allow them to thaw or you will end up with a glumpy pasta mess.